I use this software daily in all my network admin duties. It's a wonderful piece of software and I will gladly recommend this to all my friends. 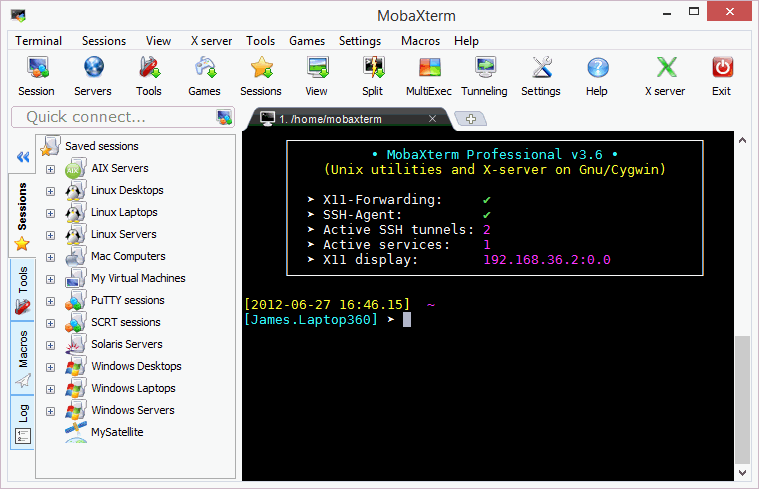 MobaXtermHere script works great on XP. Nice addition. @snaphat - Perfect! Script works great! :) Thanks for taking the time to create such a script. @freakazoid: I redesigned the scripts today to do most of the installation work automatically. It turned out there were more incompatible paths than the one you mentioned above. It should work now (I tested myself in XP). Anyway, try the new version and follow the install instructions for Open++ on my website. It's a little different from what I posted above) (that is to say- the above instructions are wrong for XP definitely). @snaphat - I had the same thing you wrote above. I don't believe this broke anything, but I still wasn't able to get your script working. FYI, I'm (still) on Windows XP if that helps. Associate with: "Single File or Folder"
Don't put the double quotes and replace \PATH\TO with the actual path to the .bat file. But wasn't able to make them gel together. If you figure out a way to get it working with Open++, let me know. @freakazoid: The other day, I created a set of scripts that implement an "Open MobaXterm here" context menu entry for windows. Perhaps that is what you were looking to do? @freakazoid - Sorry, there is no tutorial for creating plugins for the moment because we are working on a "plugin creator" interface. Currently, if you want to create plugins, you will have to create a ZIP archive containing the required files with the correct path structure and then rename the extension to .mxt3. The "GIT" plugin is a good example of how to create a plugin file. You can take your binaries from the Cygwin distribution, but you will have to manage file dependencies which can be a real headache (that is the purpose of the plugin creator program we want to develop). @mobatek - Do you have a tutorial on how to create plugins? They seem to be zipped up folders, but I was wondering what versions I'm supposed to get. Cygwin? I tried to create my own Git plugin with the Cygwin Git package (following your folder structure in your Git plugin), but couldn't get it to work. @freakazoid: you can open a folder or any file you want using the "open" command from inside MobaXterm. I hope this helps! @mobatek - Thanks! Any reason why the Git plugin uses version 1.7.0.4 instead of a later version? Also, let's say I wanted to open a specific directory with MobaXterm from the command line or .bat script, is that possible? Here it is: a Git plugin has just been added in the plugins page: http://mobaxterm.mobatek.net/download/plugins.html . @mobatek - That was quick! :) How about Git? Might give this a try. Will need to find a SVN plugin. Well, it's not a full blown replacement for Cygwin, even though it has the GNU C/C++ compiler and other plugins available. However, this thing is a real networking swiss knife and looks really useful. Going to take some time to go through all of its features. Good find. Checking this out as a portable alternative to Cygwin.